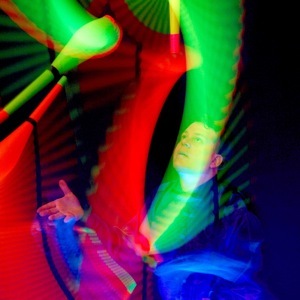 Over thirty years of experience in bringing his fun, professional, and interactive style to all types of events. 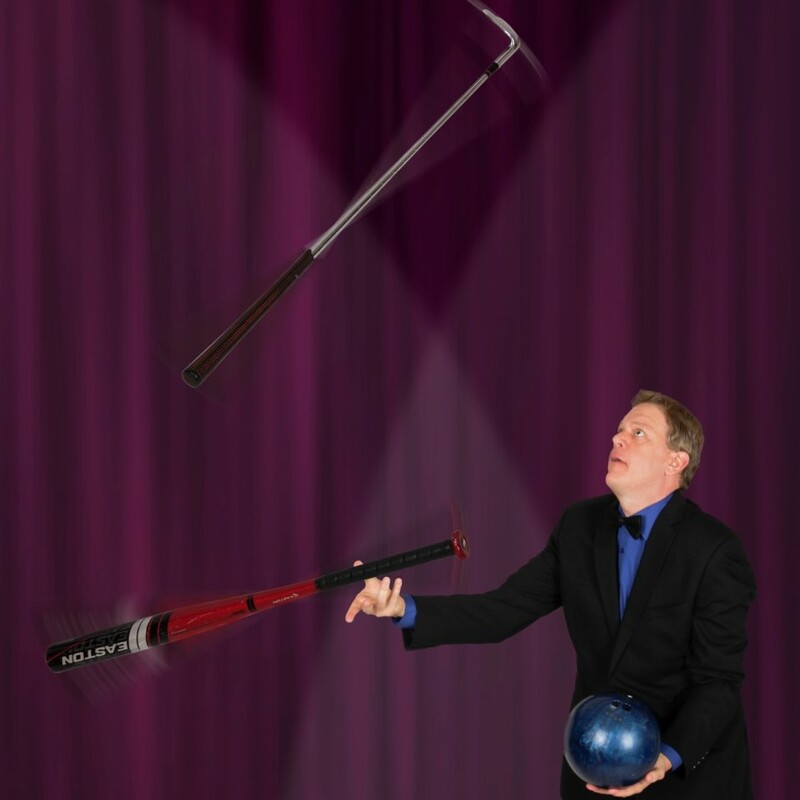 The big show includes fun comedy, unique tricks seen nowhere else, and dangerously fun weapons and bowling ball juggling. Add a Light Show or Fire Juggling for an unforgettable finale! DJ and MC services with 2000 watts of speaker power covers your sound and brings the fun to any event. Fun Walk Around Entertainment for great visual and interaction. Team Building- get your team going with fun tricks, build brain power and focus by learning to juggle! James performs throughout the Southwest US. Call now for a package that is perfect for your event! James is a true professional not only with his ability to juggle, but he innate ability to capture a crowd. Great performance and would definitely hiring him again. Gary, thanks you so much for making me a part of Debbie's 60th and for your kind words here. I had a wonderful time with everyone there, and and your wife really made the show special. Take care and I hope to see you again! Very flexible with stage layout, mics, and lighting. Crammed a lot of entertainment for the kids in one 40min show. Would highly recommend. Thank you, David! You have a wonderful group of kids and did a great, positive service. It was a pleasure working with you. Hope to visit again soon! James Reid Juggler Extraordinaire was Awesome!! He was a major hit with our Seniors here at The Palazzo. His interaction with the community residents and staff was professional and fun. We will definitely have James Reid back soon. Thank you, Kelly. I greatly enjoyed entertaining the folks there for men's appreciation day. Look forward to seeing you all again! Our event was a hit with James as our DJ and entertainment! James was the perfect addition to our Daddy Daughter Dance Event. He provided DJ services and circus themed entertainment with his juggling. The dads and daughters had such a great time and were all smiles during the event! Thank you, Ericka! I had a great time with everyone there as well and appreciate your kind words. James was very good. I will book again. Thank you, Yuvette! I had a wonderful time with the folks at Glencroft and appreciate your feedback. Hope to see you again soon. Ball juggling with interaction, juggling to music, volunteer opportunities, and unique combination tricks seen nowhere else (apples- hula hoops- rola bola!). Ball and ring in unique combinations to music. Bowling ball tricks, with volunteer, the sports routine(audience choice for kids/family show), machete and most dangerous of all- the rubber chicken! Weapons tricks with the chair of death (perfect for the boss/someone everyone knows) and weapons combination (audience choice for adult show) with apple demonstration. Ball Juggling, Club Juggling, Yo-yo tricks. Club Juggling, ball and ring juggling, and Chinese yo-yo. Props can be illuminated for evening events- perfect for cocktail hour, great warm up for the stage show. Light Show Finale: Blackout all other lighting, James provides black lights to illuminate glowing and fluorescent props. Creates an unforgettable light and sound show. Very popular with corporate and retirement events. Special holiday version available for December. Fire Juggling Finale with poi swings done to music, fire juggling with interaction, and the Flaming Axe finale. Combine show and workshop for a 60 minute (time is flexible) team building session for up to 40 adults. Multiple sessions are available for larger groups. Juggling balls are provided either for the session, or to take home at $5 a set. Add 2000 watts of speaker power along with a full music library and two wireless microphones to cover all your sound needs. Add dance time after the show, have music with walk around entertainment before hand, have James announce and keep your event on schedule.. the possibilities are many and flexible to your event! 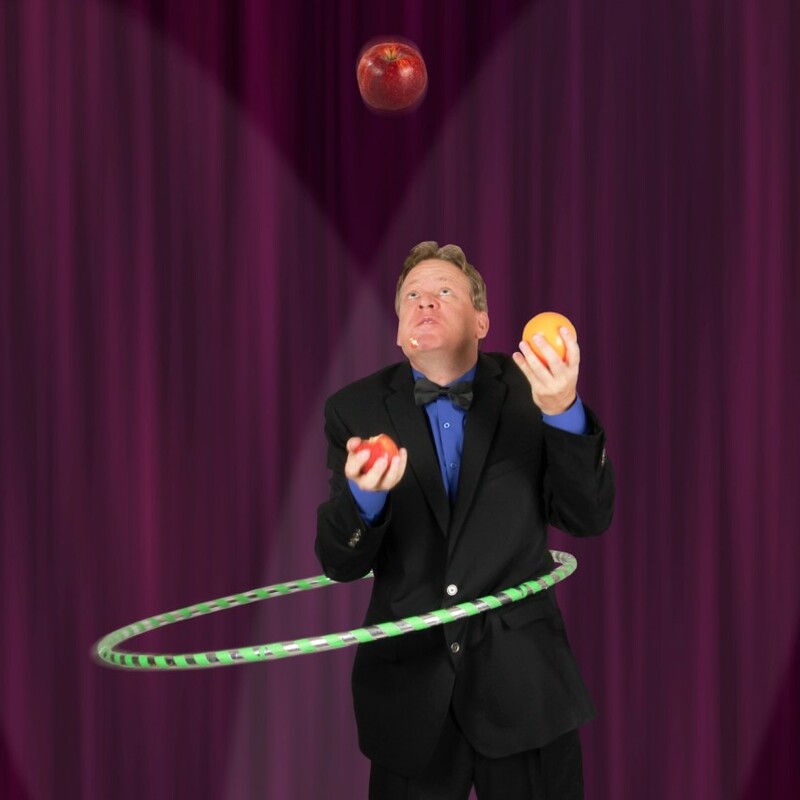 James’ love of juggling began in 1982 when he first saw a juggler in Tempe, Arizona. Mesmerized, James asked for a lesson. Less then six months later James had his first performance. So began James’ love of entertaining. 15 x 15 x 10(H) foot area and power required for full performance (can be modified down to 10' overhead). Full Blackout required for Blacklight Performance. Fire Juggling is outdoors with 15 feet from the audience, nothing overhead and nothing flammable in the area. Can be done with a 25' open tent. I supply full sound, all props, and lighting for the blacklight show. Thank you so much for your outstanding performance at our Junior Senior prom. The kids loved your strolling from table to table and giving them a chance to get to you before the main performance. The show itself was absolutely fabulous! Juggling the sports equipment was a big hit and of course the blacklight show left them breathless. We were pleased with your treatment both professionally and personally. I was very pleased with the hire of James as was my staffÃƒÂ¢Ã¢â€šÂ¬Ã‚Â¦He exceeded our expectations. I would like to take a moment to tell you how very much our children and staff enjoyed your show! Since we have such a diversity of ages at our school (preschool ÃƒÂ¢Ã¢â€šÂ¬Ã¢â‚¬Å“ middle school), I was concerned that you would have a hard time keeping the attention of all 300 students for a whole hour. But as I looked on, clearly all ages were totally immersed in the performance for the duration! You are a talented entertainer, and you put on a captivating show that we look forward to seeing again in the future. Thank you again for an entertaining morning! We will definitely be recommending you to others looking for such entertainment!